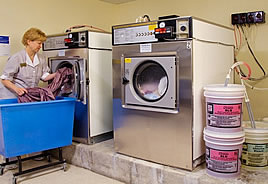 Empire Paper does what very few other laundry and warewash providers do: maintain satisfied customers. We use the newest technology in both dispensing equipment and chemical programs, using more environmentally preferable products than traditionally produced. This is further accomplished by the regularly scheduled preventative maintenance visits by our dedicated, knowledgeable, mobile service staff, available 24-hours-a-day, 7-days-a-week for emergency service. We find solutions to your dishware and laundry challenges by improving efficiency, achieving outstanding results, reducing operational costs, and offering on-site training to keep personnel safe.